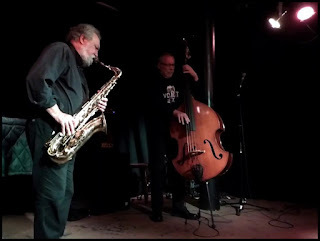 Raro incontro tra Evan Parker e Dave Holland con due concerti a completo sostegno delle attività dell'amatissimo club londinese The Vortex. E' accaduto venerdì scorso, 2 marzo, John Fordham ne ha scritto per The Guardian e Gus Iyouvid ne ha condiviso qualche bel momento su YT. A fantastic opportunity to see two huge talents Dave Holland & Evan Parker close up in the intimate setting of the Vortex Jazz Club. Holland and Parker have been friends since first meeting in London in the 1960s. During that time they performed together frequently, often at The Little Theater Club, and played on the landmark recording Karyobin which has just been remixed and reissued on Emanem Records. Holland and Parker, along with Craig Taborn and Ches Smith, appear on a new recording Uncharted Territories, due for release in May 2018 on Dare2 Records. Parker who has had a monthly residency at the club for a number of years described the Vortex as ‘my haven from the demands of the road… the Vortex is for me, a space to play “free jazz”. I cannot imagine life without it’. New York-based Holland has dropped into the club on a few occasions to take in the odd Evan Parker gig as well as to take in the unique Vortex vibe created by the musicians who perform here and volunteers who look after the place. Holland says ‘…the Vortex plays a vital role in the cultural life of London providing performance opportunities for both a UK and international community of musicians… its imaginative programming introduces new listening experiences to its audience’.